Join a small community of up to 15 participants for this immersion in the Work That Reconnects, an interactive body of work known worldwide for empowering activists in movements for social justice and ecological protection. Joanna Macy and her colleagues have been evolving this dynamic theory and practice over the course of four decades, inspiring many thousands of people to engage wholeheartedly in The Great Turning to a life-sustaining society. Drawing on Living Systems Theory, Buddhist thought and practice, and Deep Ecology, the Work That Reconnects offers a way of seeing the world as our larger living body, helping us re-examine the harmful assumptions and attitudes that now threaten all communities of life on Earth. A current evolving edge of the work is to actively address the systemic roots of power, privilege and oppression in our society in order to create spaces that are respectful and inviting for all. Learn how to be fully present to the suffering of our world and experience a shift from feelings of despair and apathy to enthusiasm for collaborative action and collective liberation. Kirstin Edelglass is a wilderness guide, ecological educator, psychosynthesis counselor, and co-founder of the New England Council Collective. She began studying with Joanna Macy eighteen years ago and facilitates Work That Reconnects in a variety of settings, including as Joanna’s assistant. The initiator of the Earth Leadership Cohort for young adults, she enjoys strengthening communities and promoting solo experiences in the natural world. 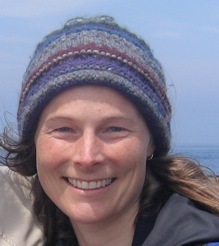 Kirstin lives in Marlboro, Vermont with her husband and two daughters. Julie (Hai Lien) Wagner has deep family roots in the land and shoreline of CT. She is a certified Master Wildlife Conservationist and Master Bird Conservationist and volunteers for several environmental non-profits. She is an ordained Dharma teacher and leads asangha at the Hai An Pagoda in New Britain, CT. Professionally, Julie is Professor at UConn where she conducts behavioral diabetes research with the neediest populations. She is married and enjoys hiking, reading, birdwatching and skeleton articulation.